After Suriya’s 24 its Mahesh Babu or Allu Arjun for Vikram. Home/NEWS/After Suriya’s 24 its Mahesh Babu or Allu Arjun for Vikram. 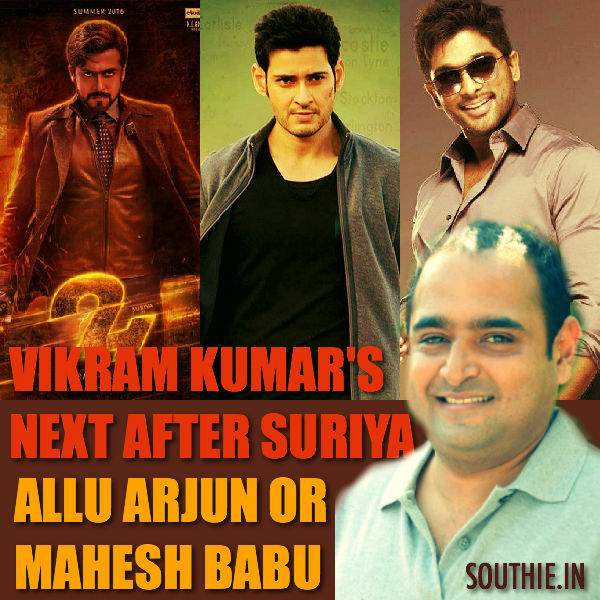 After Suriya’s 24 its Mahesh Babu or Allu Arjun for Vikram. Allu Arjun might be the most probable hero as Mahesh Babu has Murugadoss Movie. Speaking to a popular Tamil magazine recently, Vikram Kumar opened up about his next projects. Interestingly, Vikram’s next two films will be with top Telugu stars Mahesh Babu and Allu Arjun. Mahesh and Vikram combo has been in news for a long time, while Allu Arjun’s project is a recent development. Since Mahesh Babu will be acting in AR Murugadoss’ film after he wraps up Brahmotsavam, Allu Arjun has high chances of teaming up with Vikram Kumar for the director’s next.